I like to plan way ahead for my holiday trip – that means having hotels booked, itinerary planned, local transportation arranged. But travelling on business trips is a whole new ball game – schedules are always subject to change and I might never get the trip confirmed until 2-3 days before! Then there is the challenge of finding a good hotel in the last minute at a reasonable price! Thankfully, there is the last-minute hotel booking mobile app HotelQuickly which allows me to book a hotel room up to 4am on the day I plan to check in. The rooms in three-, four- or five-star hotels are offered at lower than their listed price to help fill up empty rooms and may be booked for stays of up to five days. What I liked about the HotelQuickly app is that it is very simple to use – I can book my hotel in just 3 clicks (or taps). Travelling on business means I just need a hotel with reasonable comfort and price to crash in for the night to rest and prepare for meetings the next day so I don’t want to scroll through 30-40 hotels and read reviews and compare facilities as what I would normally do when planning ahead for a leisure trip. 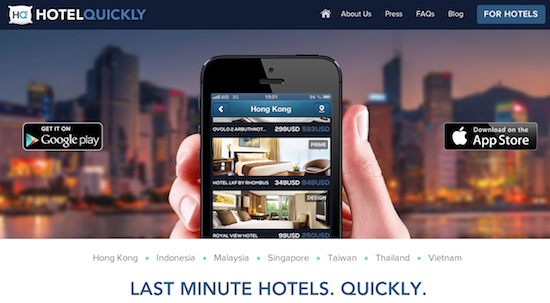 HotelQuickly seems to have thought of that too – there are only a few hotels available on the HotelQuickly app on any given day for each hotel district. So instead of perusing a long list, you will find the best short-listed 3-5 star hotels in each market. Stuck in a city you are unfamiliar with? Where to go? Where is the closest hotel to stay? Where is somewhere that’s affordable, decent, and available at this late hour? These are questions which go through the head of an unprepared traveller in an unfamiliar place – with HotelQuickly, your current location will be determined and the app gets to work to find the closest hotels with the best deals. You can enjoy a further US$15 discount off your first booking with HotelQuickly – just download the HotelQuickly iOS or Android app on your phone and register with the following code: CHOPCHOP. Even when not travelling on business, there are still many scenarios that I think HotelQuickly will come in hand – for example, sometimes, you just want to do a weekend staycation to get away from it all after a stressful workweek but it is already Friday evening! Other scenarios include a late/delayed flight, perhaps the party was too fun to leave or you just want a staycation someplace nice tomorrow! Whatever the reason, people sometimes need hotels quickly. But fast doesn’t have to be expensive, and last minute doesn’t always mean settling for less. 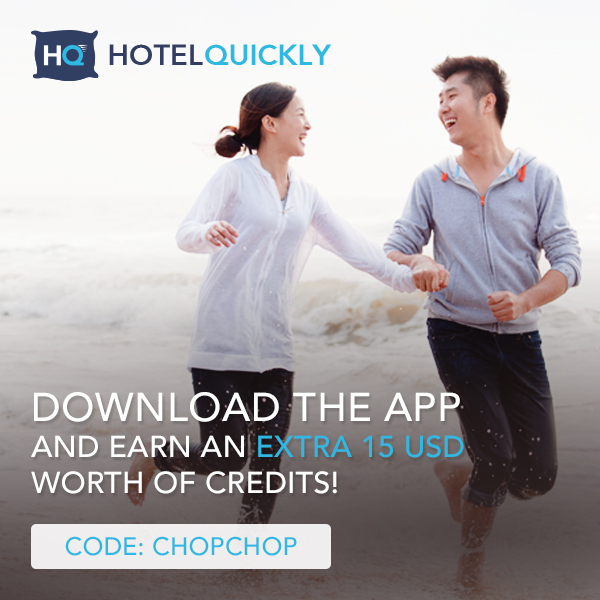 Click the picture below to download the HotelQuickly app on your Android or iPhone and earn an extra USD 15 worth of credits with the coupon code: CHOPCHOP. Now, everyone turns on their computers to book a hotel online. This easily takes 30 minutes in order to select the right hotel, pick the best location, assess best value for money, review what others think of the place and finally book a room. But if you want to skip all that hassle, HotelQuickly apply the most popular filters and only show the best hotels in close proximity. 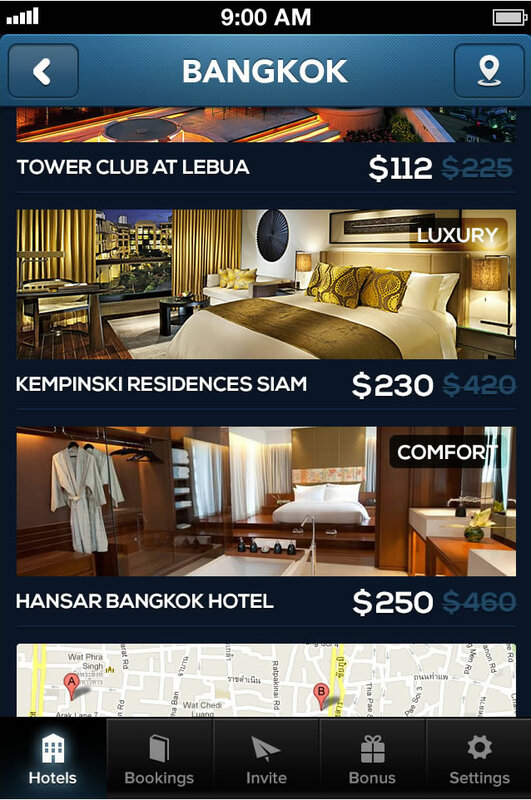 HotelQuickly is now available in 10 countries throughout Southeast Asia and the Pacific with over 300 participating hotels. Partner hotels are located in Australia, Cambodia, Hong Kong, Indonesia, Macau, Malaysia, New Zealand, Singapore, Taiwan, Thailand and Vietnam. The best part about all these is that prices shown on the HotelQuickly app are inclusive of all taxes and fees – no annoying hidden fees. HotelQuickly also gives out additional discounts and incentives to members for their loyalty and support. For every successful referral, HotelQuickly will give a 8% discount on top of the already reduced rate. In the case of five-star hotels, this can easily account for an additional US$20 to 30 saving for each successful referral. One thing to note – you will not necessarily see the steep 50% – 70% discounts (as shown in the picture above) all the time especially during weekdays (when there are more business travel) or during holidays or long weekends (where there are higher occupancy) but still a few dollars off is still better than nothing and getting a roof over your head quickly to rest for the day is much more important than spending hours trying to find the best deal. So go ahead to download HotelQuickly for free from Google Play Store and iTunes and enjoy a further US$15 discount off your first booking with HotelQuickly when you register with the following code: CHOPCHOP. You never know when you will need to tap on HotelQuickly’s services!